Broadband @ Home » Broadband News » Blast From the Past: Is Anyone Still Using Dial-Up? Broadband Internet connections have become commonplace. Employees expect high-speed access at work, schools use broadband as a powerful teaching tool, and many individuals take advantage of package deals from their telecom provider to get lightning-fast connections at home. Tablets and smartphones have advanced the field of Internet access even further, allowing users to connect wirelessly at home and in the world at large, with both Wi-Fi technology and 4G networks are seeing substantial growth in urban centers. But with all this progress comes an interesting question: Is anyone still using dial-up? Don’t Pick Up the Phone! This was the cry of every adolescent Internet user in the early and mid-1990s. Dial-up access relied on phone lines, and (unlike DSL) meant the line could only be used for one thing at a time. If you’d just about finished downloading the latest freeware version of a new video game and your brother picked up the phone to call a friend, it could mean hours of waiting down the drain. And if you wanted to make a call but someone else was online, you were greeted by horrible, screeching static. 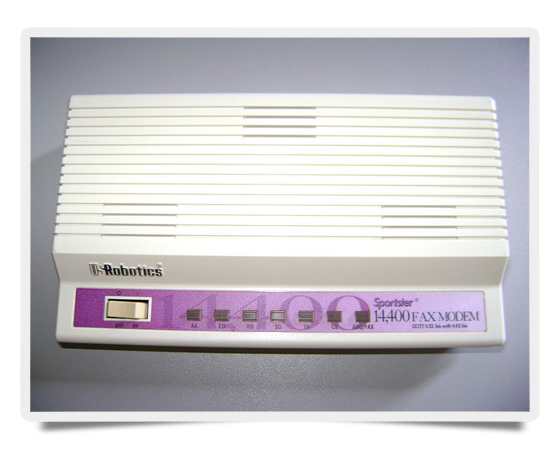 These older generation modems were often identified by the number of “bits” they could transfer per second, also known as the baud rate. The pinnacle of dial-up modems was the 56.6k (56,000 bits per second), which gave way to DSL and cable. By comparison, a mid-range DSL line transfers 1,000,000 bits per second, while a cable modem sends and receives anywhere from 2,000,000 to 6,000,000 bits per second, depending on traffic load. Incredible, right? According to a recent study by Pew Internet, 65 percent of American adults enjoy a broadband connection at home. Four percent, meanwhile, are still using dial-up. That comes out to almost 10 million users who either can’t afford the cost of broadband or live in an area of the country where alternative technologies aren’t available. The growth of wireless technologies is helping to mitigate this problem, but the simple fact remains: Dial-up isn’t dead. Several companies (such as AOL) still offer dial-up access for users, and it’s possible to purchase older model modems (at a very low cost) online, but there’s a clear trend here: Speedy Internet access is becoming an expectation, rather than an exception (remember: Make sure your broadband is robust with an Internet speed test). So make sure to take a moment and enjoy your broadband at the office, your wireless at home, or the 4G network on your tablet the next time you log on. The numbers may be dwindling, but some users are still stuck with dial-up.